"Maybe this is it," thought Silva after his July loss to Chris Weidman. At 38 years of age, Anderson Silva had already defied the odds with some of the accomplishments he achieved long before Chris Weidman knocked him out at UFC 162. Still, the question had to be asked if age and time finally caught up to the Brazilian legend, who had won 17 straight fights, 16 inside the UFC and 10 consecutive title defenses. On Thursday at the UFC 168 pre-fight press conference, Silva sat stoic for the most part decked out in a polo shirt adorned with all of his sponsors — including Burger King and AXE — as he answered a myriad of questions about the upcoming rematch with Weidman. The pendulum swung back and forth between questions about the changes Silva made to correct the mistakes that cost him the first fight all the way to the inevitable inquiry about what happens if he loses again? With the fight just 48 hours away, Silva quickly downplayed retirement rumors regardless of a win or a loss, but obviously with his mind focused on defeating Weidman on Saturday night, the chances of him addressing the subject head on were very slim. After the dust settled I was sitting thinking alone and thinking maybe I should stop. "I’m going to answer this like Ronaldo did once — of course I’m going to go back and play and I’m very happy and of course I’m coming back," Silva said while cracking a smile and pointing toward UFC president Dana White while the question was being asked. Silva did admit that he was close to calling it a career after the last fight and loss to Weidman in July. During his immediate post fight speech, Silva hinted that it may have been his last bout, but obviously in the emotion of the moment it was hard to believe he would really call it a career right then and there. The reality was Silva did contemplate retirement, but a phone call from his son actually convinced him to strap the gloves on again and get back in the cage for another few rounds. "After the last fight, after the dust settled I was sitting thinking alone and thinking maybe I should stop. Maybe this is it," Silva revealed. "But I got on the phone with my son and my son said, ‘Hey dad, do what you want to do, do what makes you happy,’ and that’s what I’m doing." As he returns for the rematch with Weidman it’s hard not to believe the magnitude for this fight is higher than ever for Silva. He personally set the bar at an incredibly high level after his improbable run through the UFC in the last seven years. 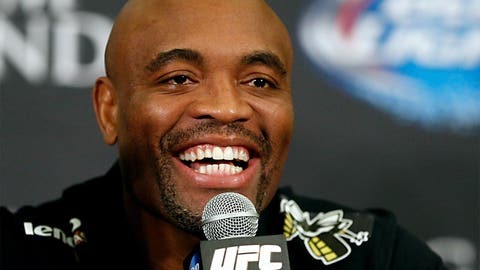 It’s hard to imagine a world where Anderson Silva loses back-to-back fights, much less two in a row against the same opponent. His plan without doubt is to go in on Saturday and avenge the loss to Weidman and then move forward with his career. It doesn’t hurt things much that Silva still has eight very lucrative fights left on the new contract he signed with the UFC earlier this year either. "I still have eight fights left on my contract and as long as I’m still enjoying it and I still want to go out there and have that desire to fight, I’m going to keep on fighting," Silva said. "If I’m going to retire, there’s no way to say that right now. That’s something that’s going to come from the heart."